The California sun is here, and we are enjoying it! We drove down to Monterey this morning with Jack and Sue. 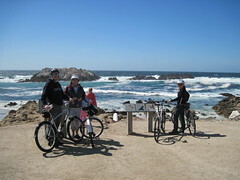 After enjoying a sourdough bowl of clam chowder on Cannery Row, we headed for 17 Mile Drive. Vehicles pay $9.50 to drive this gorgeous stretch of coastline, but bicycles are free. The wind was pretty brisk off the water, so there was no problem of overheating. We took a few hours to soak in the sun and the magnificent views. We ended the day enjoying seafood and a view of Monterey Bay. It is fun sharing our adventure with Jack and Sue.